If you find yourself outside when a storm hits, the following tips provide you with safety measures you can take to reduce your chances of storm-related injuries. Thunderstorms are always accompanied by lighting but you can have bolts of lightning without thunder. Seek shelter in an enclosed large building to stay as safe as possible from a lighting strike. If there is no building nearby, go inside a vehicle with a hardtop (not a convertible). 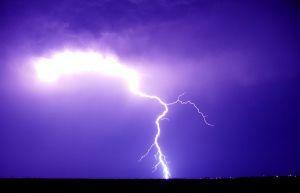 Stay approximately 15 feet away from others so a lightning bolt cannot skip from one person to another. Do not seek shelter in a tent, shed, pavilion or picnic area. Do not seek shelter under a tree, as lighting is attracted to tall objects. Stay away from all bodies of water, including swimming pools. Avoid open areas, and the tops of hills or high ground. Stay inside the shelter for 30 minutes after you hear the last clap of thunder. If lighting is close by, make yourself as small as possible by crouching down, keeping your head down and pulling your feet as close as you can to your body. Do not lie down; you want to make yourself as small as possible to give the lighting the smallest target you can. Keep your hands over your ears to protect your hearing. If you are driving when the storm hits, stop your car on the side of the road and stay inside. Keep the doors shut and the windows closed. Stand close to a building or go inside a sheltered area if possible. If you are walking outside, make sure to hold onto handrails, if available. Do not use high outdoor walkways or go onto rooftops. Pay close attention to flying debris, including street signs, yard objects or things being blown off of balconies. Do not stand under a tree, as limbs often break off from the high winds. Watch out for power lines that have fallen. If you see one do not touch anything it could be touching. If you are inside your vehicle and a power line falls on it, stay put. Be very careful not to touch any part of the metal frame. Honk your horn to attract attention and roll down your window to warn anyone who approaches your vehicle. Tell them the situation and have them call 911. Stay away from roadways and railroad tracks, as a high gust of wind could blow you into the path of an oncoming vehicle or train. If you are in your car, pull over to the side of the road. If you cannot pull over, drive very slowly and keep both hands on the steering wheel. Allow extra distance for the cars next to you, as a high wind gust can push a car out of its lane. Be extra cautious near high vehicles such as tractor trailers, buses, vans and RVs. They can be easily pushed out of their lane or flipped over by high wind gusts. Each year there are hundreds of storm-related accidents resulting in numerous injuries and fatalities. Following the procedures for outdoor storm safety will help keep you free from harm in times of severe weather conditions.